I really enjoyed visiting Sandhamn, a harbour situated on a beautiful Sandö island in Sweden. Antti had visited this place already earlier and knew that this harbour is full of Swedish tourists and summer guests later in the summer so it seems to me that the beginning of the summer was a good time to visit the place to see it when it was a bit more tranquil. The island was beautiful in the evening when we arrived and the following day we took a walk around the island's small alleys. It surprised us how bad wi-fi connection and how cold showers there were in Sandhamn but otherwise all went well. 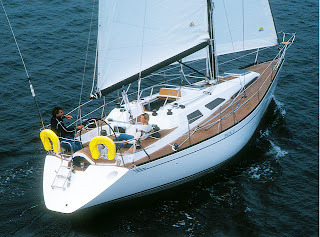 By the way, to me it seems weird that all these harbours in this information society do not offer free internet connection to their guests - first of all, we want to blog but it is also very important for sailors to get the latest weather forecasts! 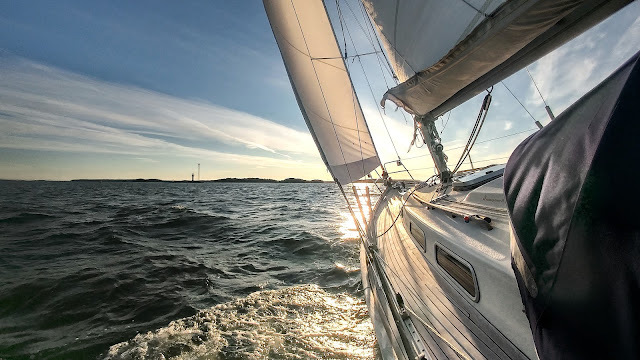 This is also why we are planning to get a mobile 3G connection at lateast in Norway so that we will be able to stay online during this summer.